Looking for the best-fit desktop devices can be a challenge. When considering the right solutions for the job, IT leaders look to balance the end user needs, security features, form factor, manageability, performance, and innovation. 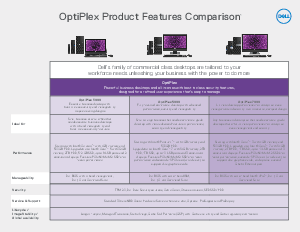 Download this concise 2-page series guide for more information on Dell™ OptiPlex™ family of commercial class desktops, featuring Intel® processors, and how they are tailored to your workforce needs.